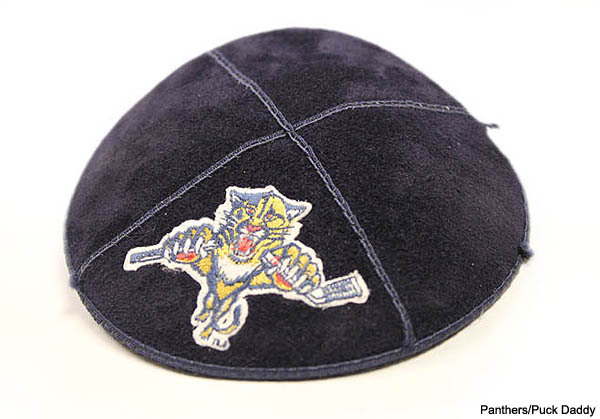 SUNRISE, Fla. – Sunrise Sports & Entertainment announced today that the Florida Panthers Hanukkah Celebration presented by The Original Brooklyn Water Bagel Co. will take place on Tuesday, Dec. 7 during the Cats-Avalanche game at the BankAtlantic Center. Prime Time Stubs, Inc. is an associate sponsor for the event. - A giant menorah lighting on the JetBlue Tarmac at 6:45 p.m. The Panther website clearly says all ticket-buyers. Fans arrived for tonight’s game and were told it only applied to group ticket buyers. I got wind of it at The Litter Box where one commenter let everyone know. George Richards of the Miami Herald has also confirmed it in his live feed of the game. The Panthers don’t have a very good rep in South Florida and this sure isn’t going to help it. It is Hanukkah after all and this region has one of the biggest Jewish populations in the nation. On a side note this particular Panther game isn’t supposed to be broadcast because it is NHL night on Versus. They have exclusive rights on these nights. Well, I’m watching a video feed with Florida Panther radio announcers doing the audio. NHL Commissioner Gary Bettman is in Sunrise tonight. Maybe he would be interested in knowing all of tonight’s screwups but he’s a screwup himself so I bet he’d shrug it off. The Panthers began their 17th season and first under General Manager Dale Tallon with a 3-2 loss to the Edmonton Oilers at Rexall Place on Sunday night. Those watching saw a different Panthers team from years past. Sure, they were still offensively challenged against last season’s worst team, missing point-blank shots that should’ve given them a 2-0 lead after one, instead of a scoreless tie. Throughout the first two periods, Tallon and third-year coach Pete DeBoer watched their charges, including seven newcomers, dominate the game with smothering defense and solid forechecking, but still trailed 3-2 on deflected goals by Dustin Penner and Ryan Jones, as well as a goal by Shawn Horcoff that appeared to have been kicked in, but stood after a review. The Panthers outshot Edmonton 23-7 after two periods (28-13 overall), but three Edmonton shots got past Vokoun. The Panthers fell to 7-7-3 in season openers, including 2-7-1 on the road. Thanks to two new Panthers forwards, Steve Bernier and former Oiler Marty Reasoner, the deficit was cut to one heading into the third. Bernier, a major part of the draft-day trade with the Canucks involving defenseman Keith Ballard, stole the puck and set up Reasoner for an open wrist shot that he buried from the faceoff circle. Then with 2:09 left in the period, Bernier fed left wing David Booth, who, showing no ill effects from last year’s concussions, ripped a shot at veteran goalie Nikolai Khabibulin that popped back to Reasoner for the stuff shot. Here is video of the Horcoff shot. The view that begins at the 1:18 mark seems to clearly show a kick. Florida lost and it was due to fluke shots and a bad call by the referees. The team and its fans have to get over it. Next up is a game with Vancouver, tonight. The Canucks are picked by many to be in the NHL finals next spring. Florida’s path at the beginning of the 2010-11 NHL season is only getting tougher. Hat tip for the above video- Donny at Litter Box Cats. HELSINKI — Brandon Sutter scored twice as the Carolina Hurricanes held on to beat the Minnesota Wild 4-3 in the opening game of the NHL season on Thursday. Anton Babchuk, back after a year in the Russian KHL, and Jussi Jokinen also scored for the Hurricanes. Brent Burns scored for Minnesota with 3:21 left, but Hurricanes goalie Cam Ward made a late save to preserve the win. Guillaume Latendresse scored for Minnesota 3:33 into the game, but Sutter tied it on a power play with 10 seconds left in the first period. Babchuk put Carolina in front at 5:58 of the second period on another power play in which coach Paul Maurice lined up three forwards. “I’ll do it again. If the power play struggles, it affects the offense, and it has been good to think of something which could be positive,” Maurice said. New Minnesota center Matt Cullen tied it at 9:52 against his former team, but Carolina upped the pace and took control. Jokinen restored the Hurricanes’ lead on a two-man advantage at 11:16, and Sutter made it 4-2 at 18:03 after a great rush by Patrick Dwyer up the right wing. Ward came away with 29 saves, while Minnesota’s Niklas Backstrom turned away 31 shots. The NHL season opener belongs in North America, not Europe. I’m dead set against regular season sports games being played any where but at sites chosen by the teams involved. The Florida Panthers won the first game of the 2009-10 season also played in Finland. They went on to finish with the 3rd worst record in the league. I expect Carolina to do better this season, but not make the playoffs. The Panthers traded right winger Nathan Horton to the Bruins on Tuesday, along with forward Gregory Campbell, for the 15th pick in this year’s draft, defenseman Dennis Wideman and a third-round pick in 2011. Panthers General Manager Dale Tallon said Horton asked to be traded in Tallon’s initial conversation with the winger after he was hired. 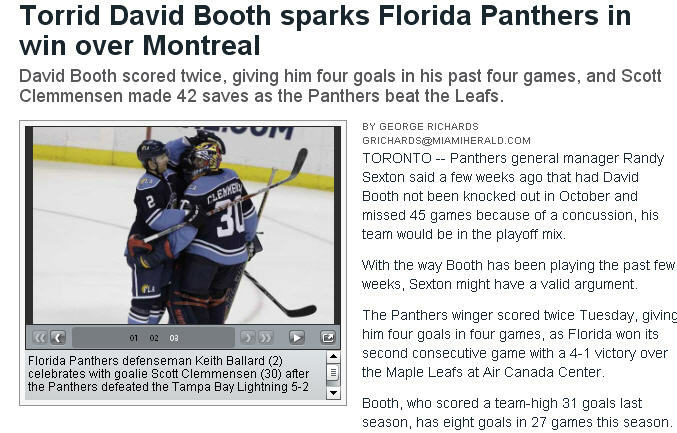 “He showed frustration and felt maybe it would be better if he was able to go somewhere else,” Tallon said. 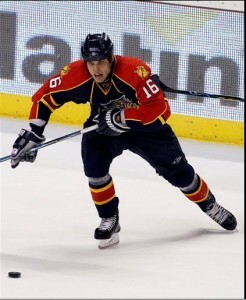 Horton, 25, was the Panthers’ second-longest tenured player. They drafted him No. 3 in 2003. He was the team’s second-leading scorer this past season, finishing with 57 points (20 goals) in 65 games. He missed 17 games with a broken leg. Horton was happy to be moving on to Boston. Horton said not getting a chance to play in the playoffs has been hard to deal with. Horton has 142 goals and 153 assists in 422 career games. Wideman, 27, had six goals and 24 assists for the Bruins this past season and averaged more than 23 minutes of ice time. First, I’m not going to miss Gregory Campbell. He was an almost total offensive zero last season who got way too much playing time because he was Coach Peter DeBoer’s pet(He coached Campbell in junior leagues). For that reason I think DeBoer was bypassed in the decision making progress that led to this trade. Unless Florida plays well next year, I bet DeBoer won’t be back for the 2011-12 NHL season. As for Horton, he’s been an underacheiver with a poor work ethic on a team that at best muddles their way through an NHL season. Trading him for a #15 is great but leaves the Panthers with a big offensive hole. 5 draft selections in the top 50 picks are great, but none of them are likely to play in the next NHL season, alone have any kind of impact. Florida could take the pick and trade for someone. Names that are being floated around include Jeff Carter, Jason Spezza, or Kris Versteeg. Florida’s new General Manager came from Chicago, so Versteeg would be the obvious one of the three above but I like Carter the most. Also blogging on the Horton trade- Donny at the Litter Box and Stanley Cup of Chowder. When he misses Tuesday night’s game in Ottawa, Carter will end a streak of 286 consecutive games played. That’s the third-longest in team history. As of this moment, Philadelphia is 6th in the Eastern Conference with 10 games left to play this season. They are 8 points ahead of the 10th place team(NY Rangers), it is therefore unlikely they will miss the playoffs but the problems at Goalie and the injury to Carter make it likely the Flyers will do a quick playoff exit.